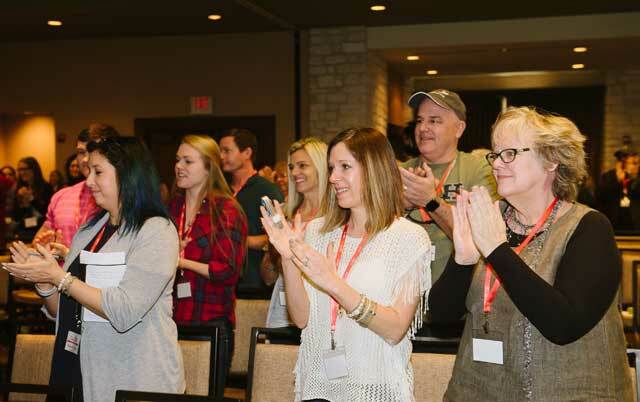 That “Wow” was my first thought at the close of last month’s Cure JM’s Family Conference in Austin. It was wonderful to visit with families I’ve come to know in my time at Cure JM as well as to meet many new families attending their first Conference. There were many highlights, and among the most important were the connections that families were able to make with many of our presenting doctors and researchers. One of the goals of the Conference is to enable families to interact with the some of the best juvenile myositis clinicians in the world, and we had a good number of them attendance. Indeed, we all reached an emotional highlight at the Saturday morning General Session when the audience of 400 provided Dr. Lauren Pachman with a standing ovation in recognition of her lifetime of service and pioneering JM research. Dr. Pachman’s lab at Lurie Children’s Hospital in Chicago has provided many breakthroughs resulting in better and earlier diagnosis of JM, standards of care, and measurements of clinical improvements. Her research has led to advances to better understand the genetics of JM, and why juvenile dermatomyositis differs biologically from adult forms of the disease. This research will result in further refinements of how JM is treated. The Conference attracted a record 120 families, and some 60 families were from the state of Texas alone. Many of our Texas families were able to connect with Dr. Ruy Carrasco, Division Chief of Rheumatology at Dell Children’s Medical Center and with Dr. Ankur Kamdar, professor of pediatrics at UT Health in Houston. Dr. Carrasco shared excellent advice with families on “How to Talk to Your Doctor,” and Dr. Kamdar shared outcomes of his research on how families can prepare for and manage transition from pediatric JM care to adult care—a topic of immense interest to our families. Information on these and other medical presentations from the Conference are available at curejm.org/austinrecap. I want to thank all of the families at the Conference who participated in the blood and sample collection for Cure JM’s upcoming genetic identification program with the Center for Applied Genomics at Children’s Hospital of Philadelphia. Understanding the genetics of what causes juvenile myositis is one of the four major priorities of Cure JM’s research investment strategy, and our proposed partnership with CAG will, I am confident, result in major advances. Some 45 families provided almost 400 samples for whole exome genetic sequencing at CAG. One really cannot underestimate the value of these samples as they come not only from the JM child, but also siblings, parents, and in some cases grandparents. The familial “chain” provides geneticists with an extremely rich comparative array of genetic data to analyze. The objective is to further identify and better understand the complex multi-genetic miscodings that play a major role in JM, and build on the pioneering work of Drs. Fred Miller and Lisa Rider at the National Institutes of Health and others in the U.S. and Europe who made initial breakthroughs in the MYOGEN project. Dr. Rider is the chair of Cure JM’s Medical Advisory Board. Dr. Rider herself presented at the Conference on the potential for new treatments with biologic drugs that are already approved by the FDA and available for patients for diseases other than JM. Some of these drugs, including Rituximab, are in clinical trials for adult forms of myositis or pediatric rheumatic diseases other than JM such as Juvenile Idiopathic Arthritis (far more common than JM). We can learn much from the success or failure of these trials. Through a 2012 trial to assess Rituxan (rituximab), a drug to treat certain lymphomas, the drug was found to be effective in some adult and juvenile myositis patients, despite the trial’s failure to meet its endpoints. Today, the use of Rituximab in JM appears to be gaining acceptance among clinicians. Dr. Rider is involved an additional important drug trial assessing the use of Orencia (abatacept) in juvenile dermatomyositis patients. This trial is currently enrolling patients at George Washington University. Parents considering enrolling their child and who would like more information on the trial should email sbullock@mfa.gwu.edu. Dr. Rider also received the Lifetime Achievement in Research Award from the Cure JM Board of Directors. We’ll keep you up to date on trial outcomes for Idera Pharmaceutical’s IMO-8400, tocilizumab, belimumab and others (for adult myositis and JIA) as results become available. As pharmaceutical companies increasingly look to apply their drug discoveries to rare diseases, we have some reason to be optimistic as we encourage more direct targeting of JM. We also learned from Dr. Ann Reed, Chair of Pediatrics at Duke University School of Medicine, of the emerging importance of autoantibodies testing for JM. Autoantibodies are produced by the immune system, and are the antibodies that attack healthy tissues and organs in autoimmune diseases. Myositis-Specific Autoantibodies, or MSAs, are those found to be implicated in myositis. Distinct autoantibodies attack healthy cells through differing processes or “pathways,” and therefore knowing which myositis-specific autoantibodies are involved with each patient may help to predict severity and complications as well as guide future treatment regimens. Autoantibody testing for myositis is becoming more prevalent and accessible in the U.S., and is often part of the development of a treatment plan after an initial JM diagnosis. Dr. Reed, who is also a member of Cure JM’s Medical Advisory Board, is advocating for more universal autoantibody testing, as more labs become proficient in such testing and as costs decline. Parents who are interested in having their children complete autoantibody testing should consult with their pediatric rheumatologist. For a list of labs that conduct this test, please email me at . Continued expansion of the Cure JM chapters across the country. The success of Cure JM’s first five chapters in the Pacific Northwest, Central Texas, Chicagoland, Greater New York, and Metro Washington has been extremely successful. The board seeks to develop five—and possibly more—new chapters in 2017, and several groups of volunteers across the country have already stepped forward to organize families in new geographic regions. Expansion of Walk Strong to Cure JM fundraisers. The results are in from Cure JM’s first two Walk Strong™ events in Seattle and Austin, and the results have been outstanding. The combined results already exceed $225,000 in online gifts alone (more funds have come in through sponsorships) with Walk Strong events upcoming in Chicagoland (May 7), New York (May 13), and Washington, D.C. (June 3). Continued focus on expanding Cure JM’s major year-end fundraiser, the Crowdrise Challenge. The Crowdrise Challenge has proven to be an extraordinary opportunity for donors to leverage their gifts by having their contributions doubled by a generous matching grant, but also by helping Cure JM win the online giving challenge. For the fourth straight year, Cure JM won this challenge, which has resulted in an additional $125,000 in grant funding this year alone. Funding research grants at higher levels. Cure JM's growth will enable us to meet this goal. Indeed, this is one of the significant priorities recommended by the Medical Advisory Board. There are two fundamental factors that create the need for larger grants. The first is that translational research projects (those focused on clinical improvement goals or drug development, for example) simply cost more money to conduct. The second is that major research institutions provide fewer internal resources to the disease-specific research projects such as those funded by Cure JM. Increasingly, researchers, especially those early in their careers, must provide sustainable base support for their work from private funders. The thoughtful and creative guidance of Conference chair Kristine Alderfer cannot be understated. Her leadership on every detail of the Conference resulted in an exceptional experience for all of us. I am most appreciative of Mitali Dave, who took on the challenge of organizing the Medical Forum, which brought together leading JM doctors and researchers from around the country and the world for a day of continuing education and learning at Dell Children’s Medical Center. Many of those same doctors presented to our families during the Conference. Thanks to Tom Hume and Carol Schwartz for developing such a comprehensive medical and family support program, and to April Duley, who led the inaugural Walk Strong to Cure JM event to record results! This Family Conference has been built on the past Conference successes led by Rhonda McKeever. Rhonda, who has served as board chair since 2008, received a standing ovation for her Legacy Leadership Award, presented by Cure JM co-founder, Shari Hume, in recognition of her extraordinary impact -- past, present, and future! Rhonda’s leadership has had an instrumental role in building Cure JM and assuring our programmatic effectiveness. Take back my life song! What could say it better?